Healthy Relaxed Hair – Talk to most African American women about hair care and chances are their knowledge of the topic will be limited. Many wore their hair in braids as children, and as adults, they regularly wear weaves or wigs. So when it comes to actually take care of their natural hair, they’re confused on what to do. Article Written by James Costabile, is a certified cosmetologist and trichologist. This article is based on relaxed hair growth. 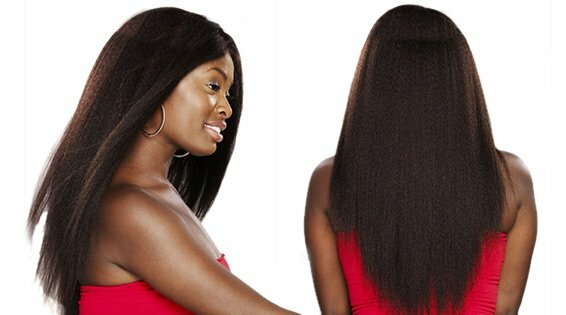 How can something as simple as hair be confusing when achieving healthy relaxed hair? Because many African American women are relying on inaccurate hair care information—either passed down through their family and friends or “sold” to them by hair replacement firms—and now they are actually doing more harm than good to their hair. The fact is that weaving, braiding, coloring, French lace wigs, and all the other hair processes black women routinely engage in damage the hair follicle, put stress on the shaft, and ultimately ruin the hairline for life. The good news is that no matter how many processes you’ve had done to your hair in the past and no matter how damaged your hair currently is, you can still have beautiful hair—the kind of hair you let your boyfriend or husband run his fingers through. The key is getting educated on the proper way to care for African American hair. So before you make another hair appointment for yourself, consider the following hair care tips. Many African Americans have been brought up to think that they only have to wash their hair twice a month. The logic is that if you keep the oils in the hair, the hair will be healthier. Granted, African American hair is by nature very dry, but the hair roots and scalp of black people are just like anyone else’s. So by not washing your hair regularly, you’re actually clogging the pores on your scalp and making your hair weaker because the follicle is not being fed. Therefore, wash your hair at least once a week with a gentle moisturizing shampoo and conditioner. Depending on your exact hair type, washing more often may be beneficial for healthy relaxed hair. For Healthy Relaxed Hair Go Easy On The Relaxers. African American hair is more delicate because of its thinner shaft. If you were to look at a strand of European hair and a strand of African American hair under a microscope, you would see that the European hair has a thicker cortex layer, making the shaft bigger. The stronger the hair’s shaft, the stronger the hair itself. Additionally, many African American bloodlines are mixed with Indian and European ancestry, so these people actually have a different hair texture than someone without a mixed bloodline. If you leave on a relaxer long enough to get the African American hair texture straight, it’s too long for the Indian or European hair texture that’s also present. As a result, the hair breaks. Depending on your exact bloodline, this may mean you shouldn’t strive for perfectly straight hair when using a relaxer. For healthy relaxed hair don’t combine processes. Mixing relaxing, coloring, and weaving is a recipe for disaster. All three processes by themselves put a lot of stress on hair—combined, they can actually cause the hair to fall out (sometimes permanently around the hairline). Think about it: you have the weakness caused from the relaxer, the weakness caused from the coloring process, and then the tightening and pulling of the braids or cornrows (the method of attachment for weaves) all putting stress on the hairline. Doing this once or twice or for short time intervals may not cause any damage, but doing this combination for years on end will damage the hairline. When that occurs, you can’t wear the weave anymore and must rely on wigs or more extreme hair processes, such as French lace wigs that are glued or taped to the scalp. If your hair were ever going to grow back, now it wouldn’t have a chance because you’re gluing a wig product on top of the hair’s root. As soon as you take the hair product off, it’s ripping the root, just like when you get your legs waxed. You’re now in a vicious circle of permanently damaging your hair. Enhance, rather than hide, your hair. African American women change their hairstyles about as often as they change their shoes (in other words, almost daily). And that’s okay…as long as you’re taking steps to keep your hair healthy. Remember, if you burn the follicle or over-process your hairline, the hair in that area won’t grow back. Additionally, it’s difficult to weave a head like that because weaving is bulky, and when you’re putting on a bulky method of attachment around a space that doesn’t have hair, to begin with, you see a line of demarcation and it looks fake. A better approach is to use a hair enhancement process like the Microdot process rather than hiding your hair under a weave or wig or over-processing it and risking permanent damage. The one thing almost every African American man hates is when he tries to touch his wife or girlfriend’s hair and feels how dry and brittle her hair is. Realize that it doesn’t have to be that way! Once you understand the facts about African American hair and how to take care of it (despite marketing messages or what you may have been told since childhood), you can have the beautiful and healthy head of hair you’ve always wanted. About the author: James Costabile, is a certified cosmetologist and trichologist. He is the inventor of the Microdot™ Technique; his company Microdot LLC provides a non-surgical technique for hair loss that eliminates the use of glues and bulky weaving methods. James has been in the business of hair replacement for over 45 years with thousands of satisfied clients.